I’m going to miss my European breakfasts! Not much to report today. 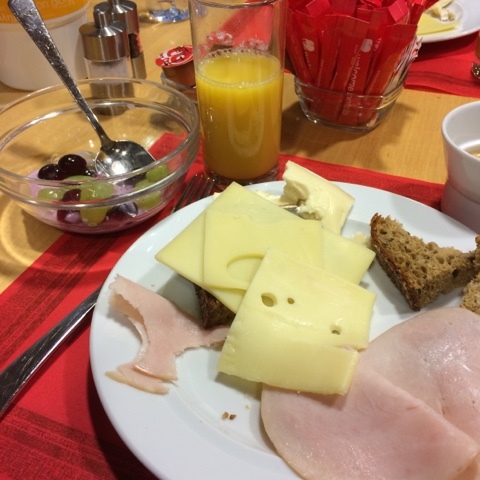 We had our first and last Swiss breakfast at the hotel this morning. Freshly made yogurt with muesli, six different kinds of cheese, turkey slices, fruit, bread and coffee were on the menu. Yum! We made it to the airport in plenty of time to catch our 10:20am flight to Newark, NJ. The flight was scheduled to be nine and a half hours, but actual flying time is more like eight hours. I sat next to the window, hoping to sleep for a couple of hours. That didn’t happen. While it was a comfortable ride, it really just wasn’t possible to rest during the daylight! I received a pretty good meal of broiled fish with rice and vegetables. It also came with a small salad, a fruit salad and a roll. I have started ordering the gluten free meal on my international flights. While I don’t have celiac disease, I have found that most airline meals are bulked up with crackers, cookies and breads. I liked knowing that my meal would be a little more heavy on the proteins and fruits. Right before the flight ended, we were served a turkey sandwich (gluten free roll) with a piece of fruit. Airline food has improved dramatically since my last flight to Europe in 2004. You don’t usually get full meals on flights to Mexico so this was nice for me. They also carried Dasani Lime Flavored Sparking Water which was a nice treat. While wine and beer are complimentary on international flights, that just held no appeal for me! In Newark, we made it through immigration, customs and security rather easily. This was surprising given that it was the Sunday after Thanksgiving. Things were going well until we reached our gate. As anticipated, our flight from Newark to Dayton was delayed four times. Then, our plane was recalled for an unknown reason. Both Mandy and I were not feeling great. She was having severe ear pain and I had developed a raw, red, spotted throat that I suspected might be the beginning of strep throat. When they started taking bags off the first plane, we knew we had to make a quick decision about school on Monday. We decided to play it safe and arrange for subs for our classes. We were exhausted, missing our families and yearning to be home in our own beds. By the time this blog post is published, I can only hope that are back home in Ohio! It was an amazing trip filled with lots of culture, professional development and new friends. I am forever grateful to the tourism division of the Spanish government (Turespaña), the Comunidad de Valencia, the Fedele for granting me this opportunity to explore Spain and its impressive language schools. It was truly the experience of a lifetime!